their life easier. And we all know the happier the editor, the better the content, and better content make for more visitors, right? Anyways, the EPi 6 system we built was a bit of a hack, we added a ControlAdapter to the PageTree control to inject css classes on the different nodes depending on what page type it was. 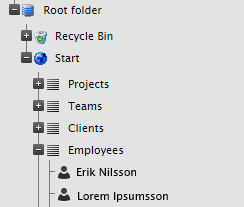 Now in EPiServer 7.5 there are systems in place to make this a lot cleaner, using the tools provided by the CMS UI we can avoid using hacks, which make for a cleaner approach that will hopefully not break as easily should the underlying structure change in future updates. Now this approach will get tedious once you start adding page types as you will need one UI descriptor for each page type. There are several ways to make this more streamlined. This post will show you one approach using attributes on your page type classes. We are going to use the EPiServer.Shell.UIDescriptor objects registered for all content types, these are added to the EPiServer.Shell.UIDescriptorRegistry during site startup. The UIDescriptor contain one important property that makes all of this work, IconClass. 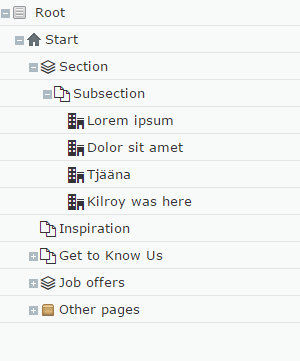 This class is added to the icon shown for each item in the page tree. I used EPiServer CMS v7.14.1 and EPiServer CMS UI version 7.15.0 when building this. The initialization module is invoked after the EPiServer.Shell.UIDescriptorRegistry is populated, and for each content type that have our custom attribute, append the css class to the IConClass attribute. This is, as per usual for attributes, done using reflection, but as it only happen once during site startup, the preformance impact is of no issue. /// Used in conjunction with <see cref="ContentIconAttribute"/> to add custom content icons for the page tree. The initializer is pretty straightforward, it finds all classes with out ContentIcon attribute and use that to modify the registered UIDescriptors by appending our IconClass. One important detail is that it has a dependency on EPiServer.Cms.Shell.InitializableModule, which ensure it is initialized after the UIDescriptorRegistry is populated with all the UIDescriptors. This approach is almost as tedious as making one UI descriptor class for each page type, this is no good. A faster way is to use a icon library, where all icons are already configured. Here, we picked Icomoon (https://icomoon.io/), they have a free library of about 400 icons in a convenient woff font format. As you can see, I prefixed each icon with icomoon, and also modified the font directive in the base class slightly.